Japan incorporated the islands under the administration of Okinawa. The Senkaku Islands dispute concerns a group of uninhabited islands which have been claimed by both the People's Republic of China and the Republic of China (Taiwan) since 1971. The Senkaku islands were not inhabited up to 1895. 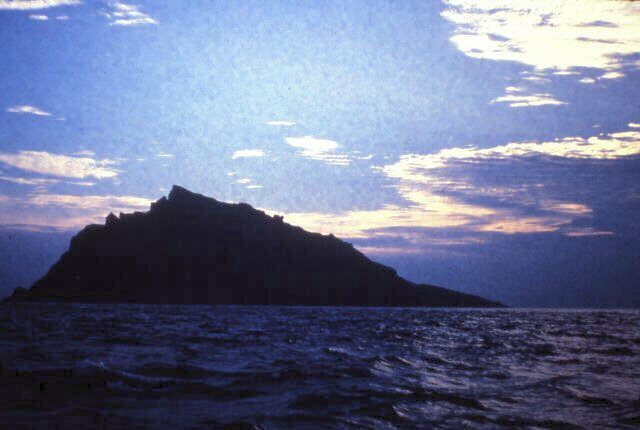 After a decade of deliberations, the Japanese government had decided to annex the Senkaku Islands and placed them under administrative rule by the Okinawan government on January 14, 1895. At the time, no countries had voiced their objections to the Japanese government's decision to annex the Senkaku Islands under the Okinawa rule. The geography textbooks, which had to be approved by the government, published in 1970 in Taiwan clearly showed the Senkaku Islands as a part of the Japanese territories. Then, these islands were placed under the control of the U.S. occupation forces following the Japan's surrender at the end of the WW II. In short, these islands have never been controlled by China up to present. In addition as another indication of this fact, the former President of the Republic of China, Lee Teng-hui, was also quoted in the Taipei Times newspaper, dated Sept. 6, 2009, that he had always considered the islands as a part of Okinawa. Then why and when China had started claiming about the islands as their own? It was after the UN investigation of the natural resources of the region, and their subsequent report of the findings of their investigation of the existence of abundant underground oil reservoir around Senkaku Islands in 1969. Suddenly, China was very interested in the Senkaku Islands and began insisting that the Islands belonged to China all along. How can the Chinese government justify their actions to pursue the territorial rights over the Senkaku Islands completely disregarding all the historical facts of the region? If another country acted the same way like China has toward your country, how would you feel? In fact, China wants to control the East Turkistan too. Redundant China's hunger for its political and territorial control extends even to East Turkistan, where its people's struggles for independence from China continue to this day.There stands a building within the East Turkistan territory constructed by the Chinese earlier, which China claims to have built it during the ancient Chinese Kingdom period. Therefore, the East Turkistan belonged to China. The idea of propping up some buildings within the East Turkistan borders and professing that China had controlled the region from the ancient times to be the truth, thereby claiming that East Turkistan belonged to the Chinese is preposterous. However, a radiocarbon dating investigation has revealed that the same structure was constructed just 5 years ago, according to the President of the Japan Uyghur Association, Ilham Mahmut. The question of whether the islands are part of China is not worth for a serious deliberation. The Islands' past history clearly indicates otherwise. What China is demanding is nonsensical and goes against all conventions of the internationally acceptable practices. South East of Japan, 300km north of Ishigaki Island, Okinawa Prefecture, there are uninhabited islands in the East China Sea named 'Senkaku Islands. 'In January 11, 1895, based on the international law, Japanese government declared the dispute of the islands. From this moment, Senkaku Islands officially became the proper territory of Japan. 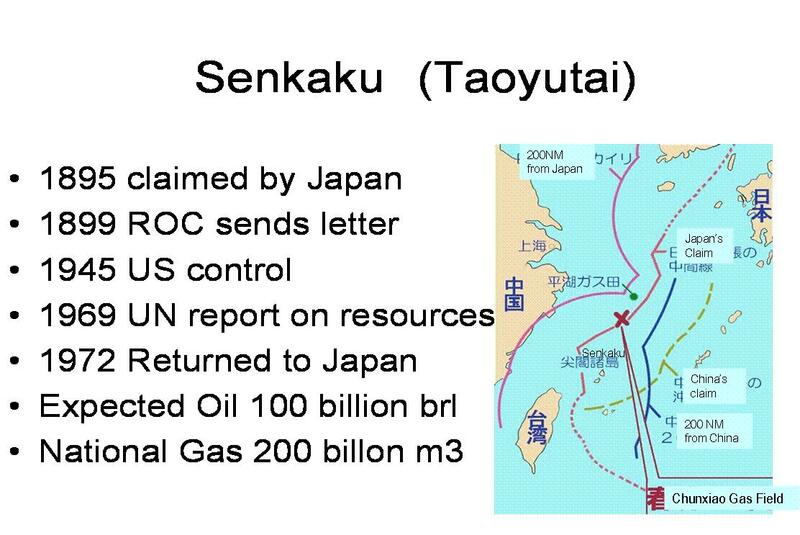 The issue on the territorial dispute of Senkaku Islands started in July 1952, when Taiwanese government permitted investigation dispute in northern oceanic area of Taiwan below 27 degree north latitude including Senkaku Islands to an American petroleum company.Also, the report from the United Nations revealed that there is abundant oil around Senkaku Islands　in 1969, which worth 1 trillion dollars. Suddenly, the fleet of Chinese armed fishing boats (Maritime Militia) appeared at Senkaku Islands and invaded Japanese waters. China claimed the territorial dispute of Senkaku Islands in 1970's after knowing that there are oil and gas in the vicinity of the islands. Can you raise your hand to show your agreement to China? China has been claiming Japan about the Senkaku Islands are Chinese territory since 1970.The geography textbook published in 1970, which year has been started Chinese accusation about the islands, in Taiwan say, where every textbook had to be officially approved by the government, clearly showed the islands as Japanese territories. Now Chinese are finding the books and burning in great haste. Why? Inside the Ring has obtained a classified Chinese map that is likely to further muddy Beijing's territorial claims. The 1969 map, produced by the People's Republic of China map authority and labeled "confidential," lists the islands as "Senkaku," the Japanese name, and contains a dividing line south of the islands indicating that they fall within Japanese territory.The map contradicts the statement on Tuesday by Chinese Foreign Ministry spokeswoman Jiang Yu, who told reporters: "The Diaoyu Islands have always been Chinese territory since ancient times, and this is the fact that nobody can ever change. China owns indisputable sovereignty over the Diaoyu Islands. The Chinese government's will and determination to safeguard national sovereignty and territorial integrity is firm and unshakable. "I want to say this is an incredible but true story. China wants to get Okinawa Prefecture　in Japan. Do you know why? There are so many wars in Chinese history, so they are very afraid of being attacked by other countries. China strongly wants to set friendly regions such as, East Turkistan (Uyghur), Tibet, Mongol and Taiwan are located in west, south, north, and east around China. China thinks that the east side of China is not enough for defense. Taiwan is a small island and a dependency North Korea’s political is unstable. These days, it is very rare case that another country attacks to another country suddenly. Can you assume that the U.S will attack Canada? Italy will attack France? Russia will attack China? All countries think if they attacked another country, their country would be isolated from the world because we already know what justice is. We can’t invade another country just because we desire to. However, China doesn’t think so. They have already invaded Tibet, so China thinks other countries might attack China. This is old way of thinking. Chinese people are always barking lies like dogs. Tell the truth; what Chinese people said about the Nanking Massacre and the Senkaku problem does not have any conclusive evidence. In addtion, they believe that telling lies 100 times lead to becoming true story from the lies. The Chinese have appealed the Nanking Massacre was caused by Japanese even people don’t have any witnesses about that. Now, Chinese people are telling Okinawa is Chinese territory. We have to careful because the Chinese conspiracy which means China will get Okinawa from Japan might work. They are telling lies enthusiastically even their story was ridiculous theory, so some people will be mind controlled by their lies. Now they are waiting another stupid historian agree with them. Unfortunately, there is a stupid person who wants to agree with them. Country China is a bribe society. Therefore, all over the world will be occupied by China someday. These days, Vietnam and China rise up their tension because of the Spratly’s territory problem. The Spratly Islands are in the South China Sea. 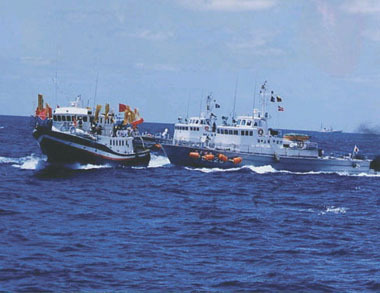 June 9 incident between China and Vietnam broke up in the area. Vietnam’s Foreign Ministry spokeswoman Nga has said, “A Chinese fishing boat and two Fishery Administration vessels cut the cables of Viking II, a Vietnamese oil and gas exploration ship that was making a seismic survey in Vietnam’s”However, China’s spokesman Hong said, “The Vietnamese ships dragged Chinese fishing boats backward for about an hour,” also “the eviction made the nets of a [Chinese] fishing boat’s tangle with the cables of a Vietnamese oil and gas exploration ship that was illegally operating at the scene.” When asked by a reporter to comment on Vietnam’s claim that Chinese fishing boats have been cutting Vietnamese ships’ cables, Hong dismissed the allegations as “absolutely contrary to the truth.”This case is very similar to the case of the Senkaku Islands territory dispute. Japan incorporated the islands under the administration of Okinawa. The Senkaku Islands dispute concerns a group of uninhabited islands which have been claimed by both the People's Republic of China and the Republic of China (Taiwan) since 1971. Sep 7th 2010 Chinese ship collided Japanese Coast Guard ships around the Senkaku Islands.Everybody have watched the video, so people knew the Chinese ship revved an engine, black smoke rose, the Chinese ship sped up, and the Chinese captain made a frontal assault to Japanese coast guard ship. However, Chinese spokeswoman said Japanese coast guard ships hit a Chinese ship. People have already known what China said are lies. The Chinese believe that telling lies 100 times, this could have lead to becoming a true story from the lies. We have to be careful.The U.S. has made several public statements making clear that the Chinese regime’s attempts to control the waters are contrary to international law and will meet with resistance.